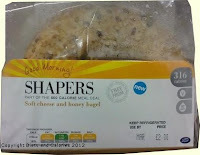 Devotees of the Boots Shapers range of foods no longer have to wait until lunch time to enjoy a Meal Deal. Over in the chiller cabinets of larger Boots stores you can now find a selection of meals which are aimed at the breakfast market. 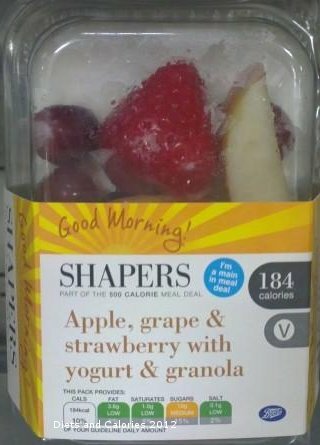 The Shapers Good Morning varieties are ideal for those who haven’t had time for breakfast before leaving home, but don’t fancy a salad or sandwich first thing in the morning. As with the other Shapers chilled foods, they’re all part of the Shapers Meal Deal. By choosing a main, a snack and a drink from the Meal Deal range, you can be sure you won't be eating more than 500 calories. (It's also cheaper this way)! A pot of creamy porridge which has to be heated up, unless you like cold porridge. It's suitable for vegetarians, is low in fat, saturates and salt and has a medium sugar content. 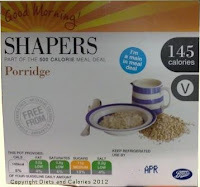 Each Good Morning Porridge Meal has 145 calories and is counted as a Main in the Shapers Meal Deal. 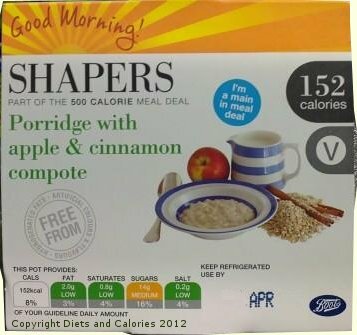 The same porridge as described above, but this variety is mixed with a delicious combination of apple & cinnamon. It has the same nutritional content as the plain porridge, but with 152 calories. It's also suitable for vegetarians. A tasty white muffin filled with ham and egg which can be eaten hot or cold. It doesn't have any mayonnaise, is low in fat, saturates and sugar with a medium salt content. 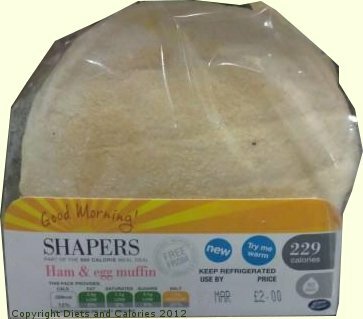 Each Shapers Good Morning Ham & Egg Muffin has 229 calories and is counted as a Main in the Meal Deal. This is a white bagel filled with smoked salmon slices and spread with soft cream cheese. It's low in fat, saturates and salt with a medium sugar content. 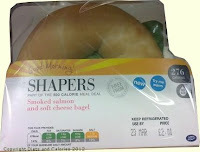 Each Shapers Good Morning Smoked Salmon & Soft Cheese bagel has 276 calories. This is a seeded bagel filled with soft cheese and honey. It has a medium level of fat, sugar and salt but is low in saturates. 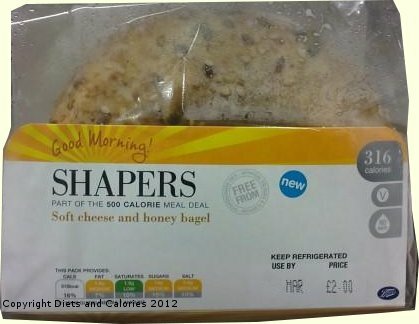 This bagel has no mayonnaise and is suitable for vegetarians. Each bagel has 316 calories. 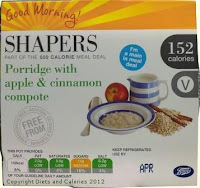 For more snacks, meals and drinks in the Shapers Meal Deal range, please click here.